I am working down in Houston now, staying at the Marriott West Loop By the Galleria, which seems an unnecessarily long name for a hotel. The hotel is decent - soft beds, good selection to TV channels, decent room service selection. It's nothing to sneeze at. 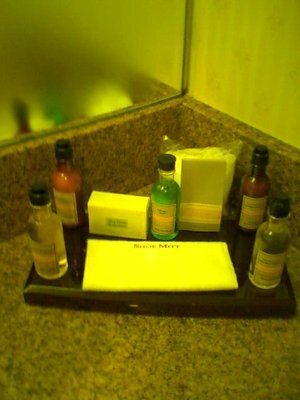 In the bathroom, they provide you a nice range of toiletries to use. There's mouthwash and skin cream (which is good, because hotels are notoriously dry and you can soon find your skin cracked and flaking in the dry atmosphere of a hotel room). In addition, there are three items for the shower - shampoo, conditioner and "invigorating body wash."
I've been using the body wash all week, but have found myself stepping out of the shower and still feeling sluggish and tired. It is not invigorating me as I would have hoped. I only find myself really invigorating once I get my first dose of caffeine via a Diet Coke. The shampoo and invigorating body wash look very similar, both yellowish liquids in a clear bottle. Today, I accidentally washed my hair with the invigorating body wash. I hope there are no long term side effects, like my head becoming confused and thinking it's part of my body. 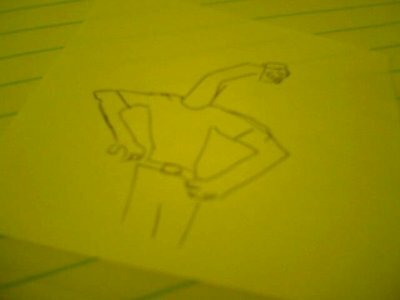 I'd hate for my head to suddenly morph into an arm or something. While an extra arm extending out of the top of my neck might make it easier to reach canned food on the top shelf, without a mouth I wouldn't be able to consume it. Sure, now I have a can of beans, but I can't enjoy it! Sharp-eyed readers will notice at the bottom of the right hand menu there is now a section for links. In addition to a link to the Travellerspoint site that hosts my blog, there are two other links (at this point). The first is to a public google calendar that I keep up to date with my most up to date travel plans. It's probably complete arrogance for me to think that anyone cares where I am, but in the event you ever think to yourself, "hey, it's Tuesday, I wonder where Greg is," click on the link to find out. If you see white space, it means it's one of the rare days I am actually in Toronto.